It is a beautiful thing when your life's work is also your passion. I had the pleasure of being an acquaintance of the late Amy Mc Courtie Robertson, a librarian who was blessed to be in that situation. Perhaps that is why she had an outgoing personality and her love of life permeated through all that she did. Mrs Robertson started her profession during the 1950s in Montego Bay in the parish of St James. She was among a small cadre of library professionals, women in the main, who believed that they were doing the important job of nation building. Among Mrs Robertson's scheduled duties in those early days was to take the library to rural communities. She walked many miles across the hilly countryside, or travelled saddle back when she accepted a donkey ride from a passing farmer. 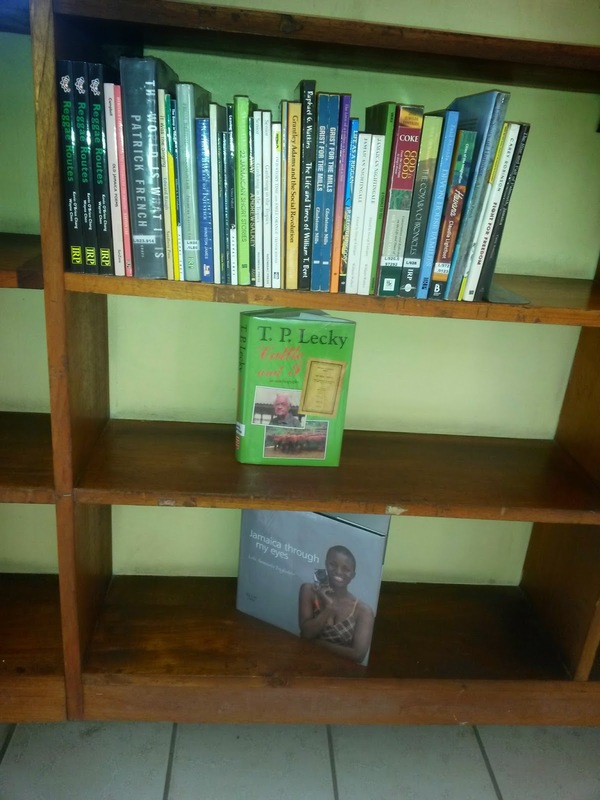 The job of taking books to remote communities, meeting people, and learning so much more about her country helped her and others to build the valuable libraries. It was taxing, but Amy described her work in words that you knew that it was always a joy, and never a burden. It is the dedication and passion of these women who made reading books and learning and gaining knowledge so much easier for the next few generations. My mother who grew up in a rural district recalls that there were visits from the mobile librarian, but before that, there was a mail order library service through the Jamaica Postal Service. So I was born in a time when the efforts of the earlier librarians were bearing fruits. I had another advantage, I lived in the capital city and libraries were always within easy reach, and going to the library was encouraged because of my book-loving parents. To pause further, my parents' love story happened because of an overdue library book. My government-run primary school had an air-conditioned library; I was regularly taken to, or took the bus to, the Kingston and St Andrew Parish Library (Tom Redcam Library) for many years; my home had hundreds of books so we called the room in which they were kept, a library. Aside from books, my father had a small, but diverse, collection of vinyl records and CDs of music that interested him. It included a recordings of Roman Catholic church music from South America and from Kenya; Gilbert and Sullivan Operettas; Jamaican popular music including Desmond Dekker, Bob Marley, Ernie Smith, Mutabaruka, Stanley and the Turbines. Western pop music by Bob Dylan and Cat Stevens. Folk music and seasonal music from Mexico and Venezuela. Calypso from Trinidad and St Vincent and Byron Lee and the Dragonnaires. There were European classical works, and Handel's Messiah was played throughout Lent each year. It extended to Enya, Michael Jackson, the Supremes, Donna Summer. It included musical theatre including Derek Walcott and Galt McDermot's musical, The Joker of Seville, which was performed by the Trinidad Theatre Workshop at UWI. There was also a spoken word recording of the books Alice in Wonderland and Through the Looking Glass. The home of my paternal grandparents had a small collection of books as well. My grandfather never owned his own home, his vehicle was a fixed wheel bicycle, and he subscribed to National Geographic for many years. My cousins and I were second-generation users of his book and magazine collection. My high school had a substantial library that was a completely stocked with books with one thing in mind, serving the needs of teenage girls. I used the UWI Mona main library while I was a student to explore art and read out-of-print material; and returned to use the West Indian section as an ordinary member of the public; I have asked for, and seen, estate maps and other historic documents that are kept by the National Library of Jamaica, again as a curious member of the public. The Jamaica Information Service, where I worked for several years, has an extensive newspaper clippings collection, an audio library and a video library, and I used them all. 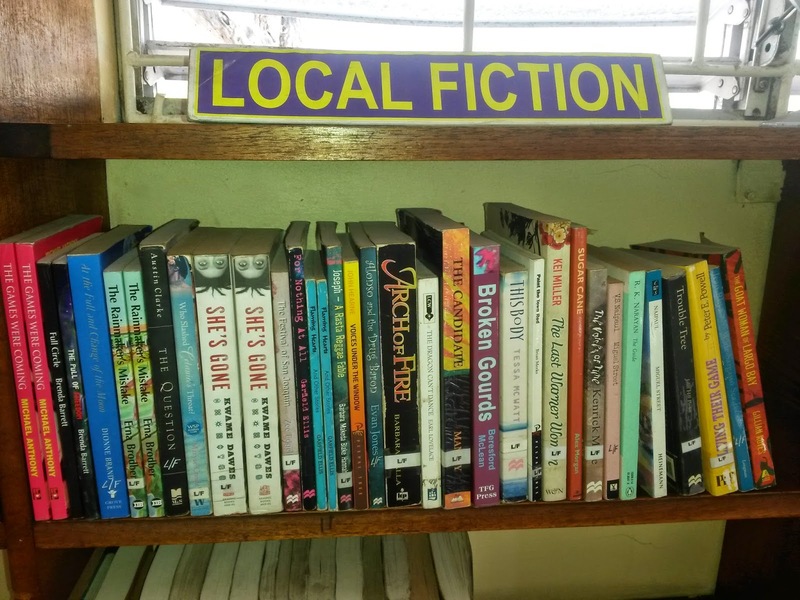 These libraries had been an ongoing part of my life but there was a short period, of about two years while I was in primary school, when I used to borrow books from the Harbour View Branch Library in St Andrew parish, Jamaica. I was in a nostalgic mood when I visited the library after an absence of about 35 years, but I decided that I must try to see it as if I was a ten-year-old, or a teen today. The popularity of reading on a digital device has made the relevance, or not, of bookstores and libraries subjects of discussion for some time now, and in a community, such as Harbour View, I have no doubt that many of the children have computers at home; but there are many children there who do not. Why would a child want to visit that library today? I wanted to find out. The Harbour View Branch Library sits on the bank of the Hope River which is dry for most of the year, and a raging torrent during the rainy period. That section of the river is an unattractive bare channel that is strewn with deposits of rocks, stones and sand. That part of the city is normally dry, so the relationship between the natural environment and the library grounds is very pronounced. The children's/junior section is about 1/3 of the library space. It is bright and painted in cheerful colours, and there seemed to be a great balance of fiction and non-fiction books, and not overwhelmingly school books. The title that seemed to catch my interest first was published by the Child Development Agency, and it was about knowing your rights of your own body. On the other side of the library was a general reading room that also had a few computers for Internet access. There was a section for Jamaican authors. Among the fiction writers in hard and soft cover were Garfield Ellis, Erna Brodber, Michael Anthony, Kwame Dawes, Garfield Ellis, Trevor Rhone, Marlon James and Donna Hemans. My book Bad Girls in School was not there, I told myself that it is in so much demand that it had been checked out. In the non-fiction section for local authors were Jamaica Through My Eyes by Lois Samuels; Cattle and I by TP Lecky; Reggae Roots by Kevin O'Brian Chang; The Rise and Fall of Falmouth Jamaica by Carey Robinson, God is Good - Conversations and Reflections on the Life and Times of Howard Cooke; Gardening in the Tropics by Olive Senior. I thought that this was was a diverse selection indeed. There were a few poetry books including The Damp in Things by Millicent Graham and It was the Singing by Ed Baugh. From this quick glance, I did see Jamaican books and literature from the 70s to as recent as about three years ago. It was ten-o-clock in the morning on a weekday, so there were only a few people in the library, including three boys in their late teens playing games on the Internet. I could perceive however, through small clues, that this may be a strong community space that caters to young people. On the walls were messages and posters that addressed youth-related topics; there was a magazine rack featuring fashion and sports titles; there was a flyer announcing the upcoming reading competition; there was a notice asking that cell phones be turned off; and aside from the ancillary worker, the staff members and security guard on duty seemed to me to be under the age of 40; born after independence. If I was a ten-year-old, the cheerful spaces and promise of discovering something interesting on the shelves would attract me to visit the library; but I would also need regular events to keep me coming back. If I was a teenager, this could be a place where I can be in the company of friends and browse the Internet, or go outside on the verandah and talk. I would also want to be able to look forward to something interesting happening at the library. If I was a new adult, this would definitely be where I can indulge in some escapism reading without having to buy a lot of books. I am happy to know that the Harbour View Branch Library seems, with this quick glance, to be going strong after all of these years, and would like to offer three suggestions. Two are to suggest that there be stronger connections between the community's sporting history and the library; the other is related to the natural environment. The Harbour View Football Club is very prominent in Jamaica, and the stadium is a short distance away. Perhaps there could be more books about the sport of football on the shelves, and perhaps have theme events that are related to the club, which is celebrating its 40th anniversary this year. In turn, perhaps the football club would put a page about the library on their website, in the same place where it has a page about what is called the Harbour View Tower. Jamaica's famous sprint athlete and sports administrator Donald Quarrie, it is said, grew up in Harbour View. The library could also make excellent use of this connection and have material about him in the library, and include sports celebrities from the community. The library is isolated at the very fringe of the community, and there may perhaps be limitations for evening and night events. In the photo on this blog, there is an arrangement of stones at the entrance to the library. When the rain falls steadily, grass grows in between the stones, but whether it is dry or lush, those stones were a nice natural climbing area for me as a child. Climbing those stones is like walking across the dry Hope River bed nearby. 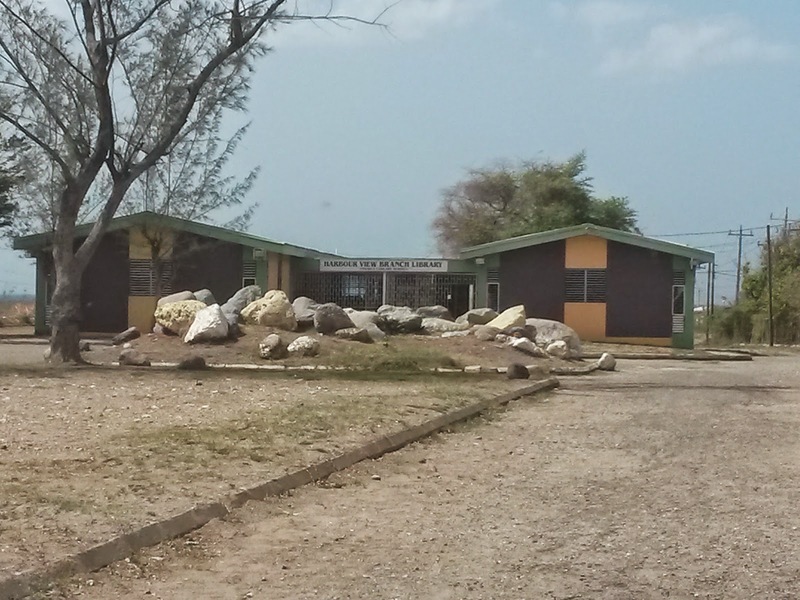 Perhaps the grounds can be a part of educational outings and field trips to promote understanding of Jamaica's geography and geology and how they are being impacted by climate change, and also change for the benefit of the country's development. Of course, these are only my thoughts on a short visit to a small community library. Their schedule of events is perhaps much richer than what I can imagine in a rush. I wish the library staff and members well. I hope that the spirit of Amy Robertson lives on there, making it a community space to expand thoughts beyond the routines of daily life. Long may it help to develop imaginative and resilient young people, and be a source of inspiration and reflection for all its users.